Modern biomedical research seeks to revolutionize clinical care through the development of new ways to combat tissue damage and disease. To contribute to this effort a researcher must understand a broad range of biomedical concepts and also have access to expertise in specific areas of research. So how might a researcher at the start of his or her career go about forming the interdisciplinary and collaborative networks that are needed to thrive in this environment, especially if the relevant expertise cannot be found in their own institution? Here we describe the design, implementation and evaluation of a joint transatlantic course in regenerative medicine that sought to prepare doctoral students for such challenges. The course was developed by employing a competency-based approach (Frank et al., 2010; Vaitsis et al., 2016) to learning design, together with elements of peer learning (Boud and Lee, 2005), and relied heavily on videoconferencing and other digital technology. Based on our own reflections and the feedback we received from the students at both institutions – the Mayo Clinic (MC) in Rochester, Minnesota, and the Karolinska Institutet (KI) in Stockholm – we also discuss the benefits we witnessed and the challenges we faced from a technological and a pedagogical perspective. Building upon a 2015 project to test the viability of holding joint, videoconference-assisted lectures, we revised our course design for 2016 with the purpose of stimulating creative thinking through collaborative work. The new design of the course offered synchronous and asynchronous elements (Hrastinski, 2008) over a span of 11 weeks, with each week devoted to a particular topic within regenerative medicine (for example, cardiovascular regenerative medicine, central nervous system regeneration, and ethics and policies). The course structure, described in detail below, consisted of: off-class online work; in-class learning sessions; and an examination task. In between weekly in-class sessions, we assigned the students to read a scientific article related to the topic of the upcoming lecture, which was suggested and often authored by the upcoming speaker, an expert in the field. To stimulate creative thinking and collaboration, we asked the students to share their reflections around the topic of the article using the online learning management system (LMS) Blackboard. Students had to critically analyze the article, and propose innovative hypotheses, methods or projects that would derive from their learning and their research experience as doctoral students. After students had submitted their own analysis, they were privy to the work of others. We encouraged them to add comments and start a discussion online. To further support inter-institutional collaboration, two students, one from each institute, teamed up to assemble all the reflections and act as journal club leaders during the upcoming in-class sessions (Figure 1A). The components and strategies used in the course “Regenerative Medicine: Principles to Practice”. 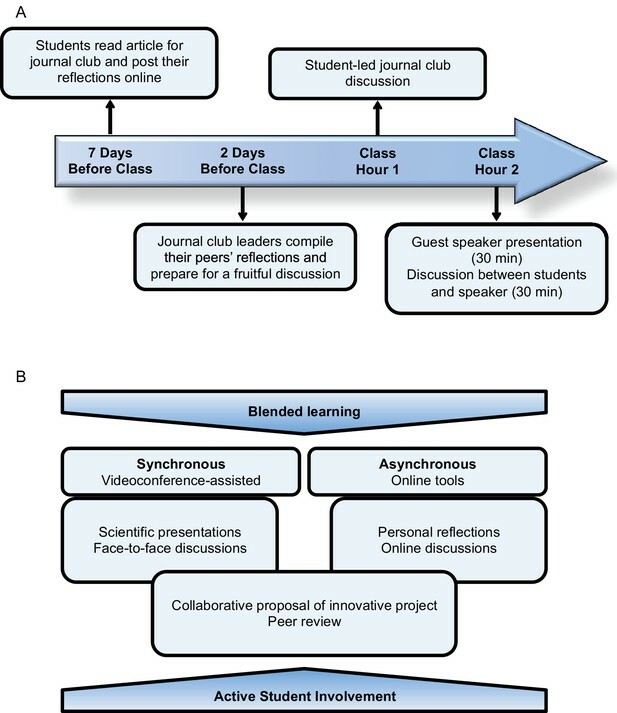 (A) Schematic illustration of off-class online work and in-class learning sessions. (B) Learning strategies used in the course design. Students, moderators and speakers synchronously shared the in-class session through videoconferencing, actively interacting during a two-hour session. During the first hour, the assigned journal club leaders led the discussion, where all students participated actively, usually without the speaker’s involvement. As a continuation, the speaker, a lead researcher from KI or MC (alternating weekly), presented his or her latest findings for the span of 30 minutes. Given the informal nature of the lecture, speakers often shared unpublished research findings. Finally, students actively engaged in a discussion with the speaker for an additional 30 minutes (Figure 1A). The examination involved writing a hypothesis-driven project proposal related to the field of regenerative medicine. Students were asked to form groups of 2–3 students, based on complementary interests and expertise, that included members from both KI and MC. Each group was challenged with the task of proposing a novel, to date unexplored, concept. In addition to addressing the background, hypothesis, methods and significance of the proposal, we asked the students to clearly explain the aspects of the proposal they considered innovative and describe how each collaborator contributed to building the proposal. We then assigned the students to peer review another group’s proposal and revise their own proposal based on the feedback. Students at MC were tasked to do a presentation and defense of their project proposal, where students were given the opportunity to learn from and question their peers’ proposals. Due to scheduling conflicts, students from KI did not participate in the oral defense of the research proposal, but participated fully in the written submission and the peer review. In recognition of the educational value of the oral presentation, we have revised the schedule to include synchronous joint presentations in the next iteration of our course in the spring of 2017. At the end of the course, we found that students considered all aspects of the course as drivers of creative thinking, in particular their interactions with experts in the field. 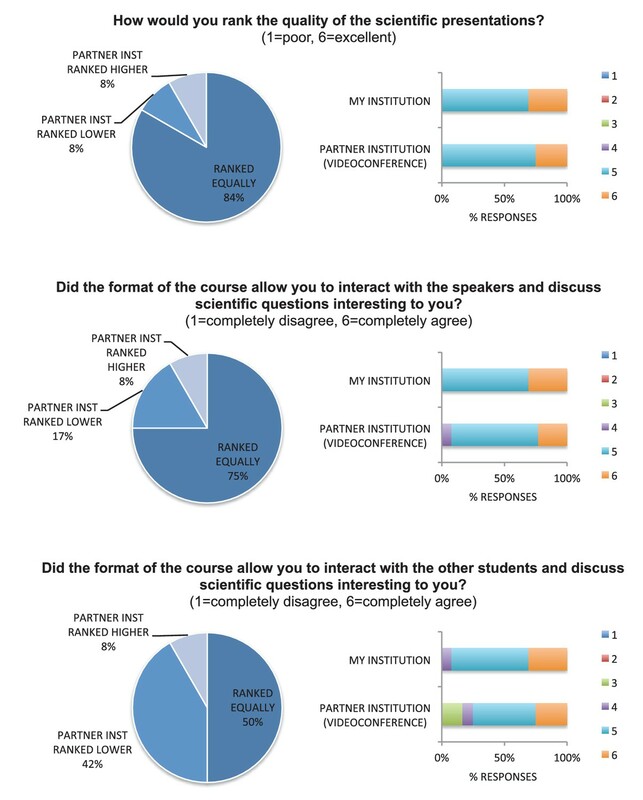 When asked to rank the course components, the students attributed the highest scores to the scientific presentations, interactions with the speakers and the final examination (Figure 2A). In agreement with this, the proposed projects included unconventional and state-of-the-art concepts from the weekly lectures. The proposals clearly showed creative and critical thinking, as well as hypothetical concepts that had been developed well beyond individual comments from online reflections or discussions. Student evaluations of the effectiveness of the collaborative course. (A) Students ranked the extent to which course components helped them develop creative research/scientific ideas on a scale from 1 to 6 (1=lowest, 6=highest). Mean rankings from students from both institutions (ALL, 13 respondents), from KI (7 respondents), and from MC (6 respondents) are reported as mean ± standard deviation. JC: journal club. (B) Students ranked the extent to which email and Blackboard were effective for student-student interactions (1=lowest, 6=highest). The preparatory phase was crucial for implementing the joint course because we had to carefully examine the intricacies of pre-established course formats within each institution. For example, MC utilizes a letter grading scale while KI utilizes a pass/fail system. At MC, standard courses during the spring semester last 12 weeks. At KI the duration and span is flexible. While we could not fully reconcile all the differences, we made sure to explain them to the students. We defined our schedule for the synchronous in-class sessions within the confinements of time zones (a 7-hour difference between institutions), with students from MC attending the sessions from 8 to 10 am, and the students from KI from 3 to 5 pm. Finally, at MC, teaching assistants, often doctoral students or postdoctoral fellows, are instrumental in the practical and daily coordination of teaching and assessment activities. At KI, course organizers (mostly assistant professors) are responsible for these roles. We found it crucial to establish a constant line of communication between the teaching assistant from MC and one assigned course leader from KI to ensure that all students received the same timely access to resources and information. From a technological perspective, we had to secure access to facilities with stable videoconference systems and utilize a functional online platform to facilitate communication outside the classroom. We used the Polycom and the Cisco videoconference systems at KI and MC respectively. This allowed bidirectional transmission of video, voice and content. Although these systems offer high stability, we acknowledge that the success of videoconferencing depended on careful prior testing of the system and on access to technical support during the sessions. Thanks to technical support, delays were minor and did not have a perceptible negative impact on the planned activities. In fact, the vast majority of students (92%) viewed videoconferencing as an effective tool to hold joint sessions between MC and KI. They perceived that the scientific presentations and the student-speaker interactions had virtually the same high quality regardless of whether this presentation or interaction was in person or through the screen (Figure 3). They also ranked highly their level of interaction with students from the partner institution, even though they found it somewhat easier to interact with peers from their own institution (Figure 3). Informal spontaneous interactions are probably more likely to occur when students share a physical location, for example immediately before or after an in-class session, while interactions with peers from the partner institution require more structure and planning. Student evaluations of the quality of the collaborative course. Students ranked the quality of scientific presentations, as well as their level of interaction with speakers and students, on a scale from 1 to 6 (1=lowest, 6=highest). Rankings for their own institution and for their partner institution are presented separately. Online tools were valuable to mediate interactions between members of both institutions outside the classroom. We chose to use the Blackboard LMS to provide written information to the students, as it offers excellent tools for course organization, communication, and dissemination of information (Bradford et al., 2007). It can also promote learning through asynchronous student-student interactions and discussions (Green et al., 2014). We asked the students to use Blackboard to post their journal club reflections and discussions. MC uses this platform and was able to incorporate course leaders and students from KI as users. Interestingly, when deciding how to interact to co-lead journal club and to prepare and execute the final examination, students preferred to communicate via email (Figure 2B) or use other tools they were likely familiar with, such as iMessage, Skype, Facetime, Google Docs and Slides. In fact, others have also reported that LMS are not the students’ preferred means of communication (Back et al., 2016). In our experience, a dedicated LMS was highly beneficial as a repository for course information. We found the experience of implementing this course highly rewarding for both students and course organizers. Students and instructors alike had the opportunity to learn from experts in an informal, relaxed learning environment, and the students had the opportunity to team up and develop creative proposals that aim to tackle complex biomedical problems using state-of-the-art knowledge. We made this possible through establishing a robust technology-assisted environment. Videoconferencing and online tools were effective at mediating synchronous and asynchronous interaction between members of both institutions. In addition, the course design motivated students to take a creative and collaborative approach. We incorporated many pedagogical strategies that have been shown to enhance student learning, including blended learning environments – online learning systems and face-to-face instruction (Robin et al., 2011; Ruiz et al., 2006; Banerjee, 2011), collaborative learning, and active student involvement (Al Achkar, 2016; Connell et al., 2016), including elements of peer learning (Boud and Lee, 2005) (Figure 1B). In doing so, we are able to explore the possibilities of broadening the scope of the educational environment. The peer-led sessions allowed students to use their networks of learning (Boud and Lee, 2005); the outcome-based design (Vaitsis et al., 2016) of the course made both asynchronous and synchronous activities possible (Hrastinski, 2008). While similar efforts have been performed previously, we argue that our course constitutes an important step toward training students to develop professional collaborations within an international research network and independent of their principal investigator in the context of regenerative medicine. This type of training is of particular importance for doctoral students interested in pursuing an academic research career. Thus, we propose that new joint courses could explore the possibility of building actual grant proposals, or even executing short but innovative collaborative projects. Here, we acknowledge a need to increase and enhance the feedback students give to each other during unmonitored asynchronous learning (Hrastinski, 2008; Boud and Molloy, 2013). We conclude with some practice points for institutions interested in organizing a course similar to ours. Define common grounds for learning outcomes, learning activities and examinations. Identify and prioritize important aspects of the course that require the active participation of students from both sides of the screen during synchronous sessions. Keep an even balance between the number of students from both collaborating institutions. Course facilitators need to be ready to solve technical issues or to contact technical support. They should ensure a balanced interaction between members from both sides of the screen but should otherwise not dominate the conversation. The formation of groups to design inter-institutional collaborative projects can be self-propelled or facilitated by the course organizers. In either scenario, members within each group should have complementary interests and ideas. Advances in Medical Education and Practice 7:317–320. International Journal of Medical Education 7:267–273. Journal of Asynchronous Learning Networks 15:8–19. Studies in Higher Education 30:501–516. Assessment & Evaluation in Higher Education 38:698–712. Journal of Educational Technology Systems 35:301–314. Thank you for submitting your article “Just a click away: Using digital spaces to promote trans-Atlantic collaboration and creativity in doctorial students” to eLife for consideration as a Feature Article. Your article has been reviewed by two peer reviewers. I (Reviewing Editor) have overseen the evaluation and have drafted this decision letter based on the reviewers' reports to help you prepare a revised submission. The following individuals involved in the review of your submission have agreed to reveal their identity: Derek Groen (Reviewer #1). The reviewers read your paper with pleasure and appreciated the arguments that doctoral students in regenerative medicine require access to scientific understanding of interdisciplinary biomedical concepts and to novel technological solutions. The description of how a collaborative technology-assisted platform has assisted student learning and the creation of research networks is one that will be of value and interest to a broad audience. 1) In terms of presentation, the paper mixes the “creation of research networks” with “joint transatlantic teaching” in a manner that is confusing to the reader. The story could be sharpened by a clarification along the following lines: by collaborative transatlantic teaching & scholarship (through the student-led journal clubs), students become familiarized with the mechanisms involving in transatlantic collaborations and help prepare them for the future participation in international research networks. 2) In relation to point 1, it may be a bridge too far to claim that this approach stimulates “the creation of research networks”, as those networks have been largely pre-constructed as part of the module design. 3) The figure is of benefit to the paper, but a second one would help clarify things much further. Such a second figure should clearly contain the teaching elements and techniques that made up this distributed module, so that the reader can see what existing practices have been combined to create this unique new way of teaching (subsection “Implementing a successful translatlantic doctoral course”). The figure doesn't have to be exhaustive, but it should serve as a strong vehicle to clearly convey the key elements needed for this, and give the reader an idea of what they need to apply the digital spaces-based teaching in their own academic context. 4) The subsections of “Designing a joint course to promote collaborative creative thinking” do not fit well with the categorization at the start of that page (student-led journal club, guest lecture, and discussion session). Please revise those subsections, so that they match well either with the categorization at the start, or with the elements of your “new” Figure 2. 5) Please revise the descriptions in the “Examination” subsection. Especially, did the students of KI not participate only in the presentation/defense part, or were they excluded from the examination altogether? You should also avoid writing “we regret this decision” when a scheduling conflict clearly beyond your control has prevented you from doing this particular activity. 6) Please provide the data from your surveys that supports the statements made about the students’ experiences of the course. Below is a suggestion for how you could incorporate some of this information into the article, based on the PDF of survey results that you sent me when we initially discussed writing a Feature article. – The top figure on page 5 of your survey results PDF (with the percentage of responses) could be added to the article as a new figure; the results from the bottom figure on page 5 (with the mean rank) could be integrated into the top figure (for example, by moving the explanation of the colours to above or below the figure, and printing the mean rank for each row to the right of that row). Table 1 could then be deleted. – The figure on page 1 of the results PDF (pie chart with the percentage of responses on the effectiveness of videoconferencing) contains just two data points so these could be worked into the text and/or the caption for the new figure. – The figures on page 2/3/4 of the results PDF (from the results of the quality of scientific presentations to the effectiveness of means of communication for online group work/discussions) could become figure supplements to the new figure. This might involve deleting Table 2. 7) Further to point 6, please provide the number of students on the module respectively for both institutions. It would also be good to see a breakdown of the student ratings from both MC and KI (currently shown in Table 1). Please also provide standard deviation values (perhaps using the commonly adopted +- notation for ease of reading) to give an idea of the uncertainty range. 8) It would be good to comment on the use of “reciprocal peer learning”, given that the students are interacting on various platforms. And if you do, you should perhaps add a comment or two on the benefits of peer learning to student learning (see for example articles by David Boud), and also on whether this type of learning has already been successfully used in online environments. In addition, what is the evidence for “international” interaction using these learning strategies? Is this study the first of its kind? A review of literature would suggest otherwise. We recognize the importance of this clarification and have included the following statement within the Introduction to help distinguish between the collaborative teaching/scholarship and the actual creation of research networks in the future. The additional sentence reads, “Through this model of collaborative teaching and scholarship, it is our aim that students become familiarized with mechanisms involved in transatlantic collaboration in order to prepare them for future participation in international research networks.”. We agree with this comment and have revised the conclusions of this paper accordingly. In order to emphasize the difference between training students in the mechanisms of international collaboration and the actual creation of research networks, the last paragraph of the manuscript discussion now reads, “Given our experiences outlined above, we would like to encourage other international institutions to implement a design similar to ours in the interest of sharing scientific resources and training early-career researchers to create international research networks.”. We thank the reviewers for the suggestion, and agree that a second figure will improve the paper. We have created a new figure (Figure 5) that shows the teaching techniques that were used in this course, and how the various course elements fit into our teaching model. We thank the reviewers for the suggestion and have modified the section to include a clearer categorization of the course structure. The introductory paragraph now states the three major course components: (A) off-class online work, (B) in-class learning occasions, and (C) an examination task. The subsequent three paragraphs use these as subsection titles for the in depth discussion of each component. We have followed the reviewer’s suggestion and have included the top figure on page 5 of our survey results and added the mean rank for each component to the right of the figure. This corresponds to Figure 2 in our revised article. Also, we have deleted Table 1. These data points are included in the text: “In fact, the vast majority of students (92%) viewed videoconferencing as an effective tool to hold joint sessions between MC and KI”. We have incorporated these survey results as new figures in the article: Figures 3 and 4. We have removed Table 2. The total number of students that took the course in 2016 was 17. Thirteen of those students chose to participate in the voluntary anonymous survey we conducted. We have specified the number of respondents from each institution in the legend of Figure 2. We have also added a breakdown or the students’ ratings for both MC and KI, including standard deviation values, as part of Figure 2. 8) It would be good to comment on the use of “reciprocal peer learning”, given that the students are interacting on various platforms. And if you do, you should perhaps add a comment or two on the benefits of peer learning to student learning (see for example articles by David Boud), and also on whether this type of learning has already been successfully used in online environments. In addition, what is the evidence for “international” interaction using these learning strategies? Is this study the first of its kind? A review of literature would suggest otherwise. We thank the Regenerative Medicine and the Development and Regeneration Doctoral Programs at Karolinska Institutet for providing funding and support for the implementation of this course. We thank the Clinical and Translational Sciences Predoctoral Program, the Center for Regenerative Medicine and the Department of Molecular Pharmacology and Experimental Therapeutics at Mayo Clinic. This project was partly supported by CTSA Grant Number TL1 TR000137 from the National Center for Advancing Translational Science (NCATS). Its contents are solely the responsibility of the authors and do not necessarily represent the official views of the NIH. We thank Cindy Gosse and Harold (Tony) Hanson for course organization and technical support at Mayo Clinic. We also thank the Mayo Clinic Media Support Services Department for successful implementation of videoconferencing. We thank Evren Alici, Pauliina Damdimopoulou, Fredrik Lanner and Hong Qian, for contributing as course organizers and facilitators at Karolinska Institutet. We also thank technical support from Karolinska Institutet. © 2017, Groen et al. Two institutes on opposite sides of the Atlantic developed a joint course to encourage networking between early-career researchers.